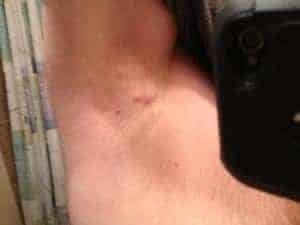 What causes painful lumps in armpits? How do you treat lumps in the armpit and are they a troublesome medical condition? According to webmd.com lump in the armpit are non-cancerous closed sacs or closed pockets of tissue are filled with fluid, pus or other material. Healthline.com define armpit lump as an enlargement of one of the lymph nodes under your arm. According to com Lump in the armpit, generally refers to swelling or enlargement of one of the axillary lymph nodes located under the arm. Lymph nodes are very small clusters of immune cells that are an important part of the body’s lymphatic system, which is part of the immune system. Your body relies on the lymphatic system to fight off germs, infections and abnormal substances, such as cancer cells. Swollen or enlarged Lymph nodes are also referred to as lymphadenitis or swollen glands, they can affect any age group within a population, but research has shown that they occur often in children. Throughout the body, there are more than 500 lymph nodes, but however, the ones that frequently swell or get enlarged are the ones located in the groin, in the neck, underarms and under the chin. A swollen lymph node under your arm could arise due to infection, malignancy, and autoimmune disorders. Painful lump in armpit caused by a viral infection often gets better on its own, but a lump caused by bacteria or pathogens may need some medical attention. A lump in the armpit can be a sign of cancer such as breast cancer or lipoma. You need to seek medical care if a lump in the armpit is growing, tender, irregular in shape, red or been around for more than 5 weeks. Painful lump. Lumps are normally painless but in some instances, they can be painful. The pain can be severe, and it comes before the actual lump begins to develop and could be worse as you try to rub your arm over it. Infected lump. Symptoms of an infected lump include tenderness, redness, pain and warmth around the affected area. Small or Large lump. A Lump in the armpit is usually small in size but sometimes they can be large with an irregular shape. Ingrown armpit hair lumps occur when shaved hairs curl back into the skin. It can grow sideways and cause ingrown armpit hair lumps or an ingrown hair can get a bacterial infection hence result to formation of a lump under your armpits. Deodorants are made up of chemical ingredients that may cause a reaction such as irritation on the skin where they are applied, these further results to a raised lump on the skin. On the other hand, antiperspirants are a remedy for excessive sweating. They can clog sweat pores on the skin especially in the armpits hence causing a raised lump. Hidradenitis Suppurativa is an infection of the sweat glands by bacteria which in turn causes painful lumps in armpits especially in teenagers. In most cases, hidradenitis supputativa can spread to the groin area and lead to swelling, boils and painful lumps in the underarm area. This condition is common in men than in women. To treat Hidradenitis suppurativa, your doctor may recommend antibiotics to treat and relieve pain in the lump or immunomodulatory medications if the lump is infected or anti-androgens and in severe cases surgery is necessary. Immunization is sometimes accompanied by side effects, particularly at the area of injection. Hepatitis A vaccines can cause lumps and swollen glands in the armpits and other areas. Tdap vaccines are also known to cause lymph node swelling. Also, Flu shots are a possible cause of the painful lump in armpit. It is important to seek medical advice since the swollen glands could be as a result of another infection as opposed to the vaccination you got. There are many viral infections that can cause lymph nodes to swell and this result to lumps in the armpit. Some of the viral infections include chickenpox, herpes, shingles, HIV-AIDS and STDs. Lymph nodes may swell as a result of filtering out cells of infectious virus or pathogen. However, it is important to get diagnosed by a doctor so as to understand the exact cause of swollen lymph nodes. The overproduction of thyroid hormones is also known as hyperthyroidism. When hyperthyroidism happens it causes a painful lump in armpits, especially in the male. Stress and hormonal changes during pregnancy can also cause painful underarm lumps due to overproduction of sebum, which literally clogs the pores, causing lumps, whiteheads, and pimples. The lymph nodes are primarily meant to fight off bacteria, viral and fungal infections. In the process of filtering out the cells, they swell and begin to cause pain. Swollen lymph nodes are common in the Jawline, groin area, behind the ears and neck. It is advisable to seek medical attention to determine the underlying cause of enlarged lymph nodes. Boil zits and cyst can begin as large bumps in the armpit. Infected ingrown hair and shaving bumps are responsible for these lumps. If they are left un-attended to they can easily turn into large lumps. Cysts are bacterial infections and usually pus-filled. According to mayo clinic, a lipoma is a slow-growing, fatty lump that’s most often situated between your skin and the underlying muscle layer. They are usually small lumps. Lipoma may feel doughy and moves if you apply pressure to it. At times, it can be grown and becomes painful. 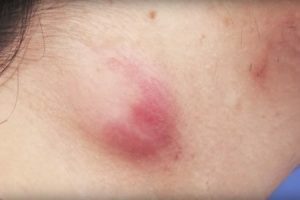 if the lump doe,s not resolve on its own after a few weeks you need to see your doctor for further examination because there could be a potentially serious cause of this lump. Pea size painful Lump underarm are usually due to cysts. Cysts are harmless and can also make your skin to turn yellow in color. Since these lumps are harmless but painful you may consider options like steroid injections, surgery or liposuction. In many instances, lumps on your underarms will disappear on their own. However, some might require treatment or removal. The removal or treatment options will squarely depend on the cause. To examine them your doctor will squeeze the lump between his thumb and forefinger while moving it back and forth. According to University of Maryland Medical School, the following are remedies for a painful lump in the armpit. Biopsy or Chemotherapy. A biopsy or chemotherapy might be necessary if the lump or lumps is suspected to be cancerous. Medical Injections. Cortisone or steroid injections can be administered to shrink the lump. The steroid injections reduce swelling and inflammation. If the lump happens to be infected your doctor may recommend medications such as antibiotics or antifungal depending on what caused the infection. Surgical Removal. Surgical removal is usually considered as last resort when all other medical options have failed or when the lump is large and accompanied by troublesome symptoms. Popping and draining. Some lumps especially if they are pus-filled may require popping and draining for the symptoms to go away. Popping might need a scalpel or needle and a specialist should assist in doing so. Home Remedies. Home remedies can be used to treat underarm lump. Some of the remedies that can be used have been explained below in this article. The antioxidant properties in watermelon help detoxify the blood and eliminate the lump-causing bacteria. It also reduces the swelling in the affected area. This fruit will not just keep you hydrated, but will also cleanse your body and get rid of your painful lump underarm. Drink watermelon juice every morning. The moisturizing and anti-inflammatory properties of Aloe Vera can stimulate healing of that painful lump in your armpit. It also helps reduce pain and swelling. 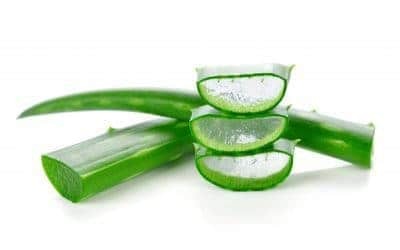 Take a fresh Aloe Vera leaf, open it to extract the gel. Apply it to the lump in your underarm area, rubbing gently in circular motion. Leave it on for about 30 minutes, and then rinse it off with cold water. Use aloe vera remedy 3 times a day for a period of 1 week. Echinacea is known for healing and strengthening the lymph system. It is also a strong antibiotic that help eliminate infection by purifying the blood. Apply Echinacea cream or ointment to the lump 3 times a day for a period of 1 week to get rid of armpit lump. Alternatively, to fight infections that cause armpit lumps, drink 1 to 2 cups of Echinacea tea daily for a week. Lemon juice is rich in vitamin c and many antiseptic, anti-inflammatory ingredients that help to reduce swelling, and pain of an armpit lump. Lemon juice has antibacterial properties that help to enhance healing by fighting bacteria. Put a lemon juice in a glass and dip a cotton ball inside the juice. Dab the cotton ball over the lump and leave it for 60 minutes. Alternatively, you can add lemon juice and some honey to a glass of water and drink it twice daily for a few weeks to accelerate healing. Apple cider vinegar helps to dry out the lump and reduces symptoms like pain and swelling. It is also known to have antiseptic and antibiotic ingredients that help to fight infections and promote healing. Mix equal parts of unfiltered apple cider vinegar and water. Soak a cotton wool in the solution and apply it on the affected area. Leave it to stay for at least 3o minutes and then rinse it off with distilled water. Repeat this process 3 times daily for a few days until the lump in your armpit disappears. Warm compress is a remedy that has been used to get rid of lumps on the skin for a very long time. When Warm compress is used the hot temperature helps to increase blood circulation, reduce the size of the lump and ease the pain. Soak a washcloth in hot water and then wring out the excess water. Place the washcloth under your armpit for 10 Minutes. Repeat these 5 times daily for 1 week until the lump in your armpit. Turmeric contains antibiotic, antibacterial and anti-inflammatory properties that help treat armpit lumps. It can help to reduce pain and facilitate healing. Mix 2 tablespoon of turmeric with 2 tablespoons of turmeric and few drops of water to make a paste. Apply it on the affected area, wait 10 minutes and then rinse it off with warm water. Repeat this process 2 to 3 times daily for a full week. Alternatively, drink a glass of warm turmeric milk daily for a couple of weeks. Coconut oil is a good moisturizer for armpit lumps. It is also known to be anti-inflammatory, anti-bacterial and antiviral properties that help to promote healing. Warm up some coconut oil and apply it on your armpit. Use gentle strokes to massage the affected area for 5 minutes. Gentle massage enhances blood circulation and helps to reduce swelling. Repeat a few times daily for a week. You can also eat 1 teaspoon to 1 tablespoon of extra-virgin coconut oil daily. Garlic helps to cleanse the lymph system, ease symptoms such as pain and inflammation and at the same time accelerate healing. Make a paste of a few garlic cloves and apply it on the affected area. Allow it to sit for 10 minutes, then, wash it off with warm water. Repeat this twice daily for a week. You can also eat 2 to 3 raw garlic cloves on an empty stomach daily; include garlic in your cooking as well. Vitamin E is an effective antioxidant that can help treat an armpit lump within a few days. it reduces swelling and prevents fluid buildup in the lymph nodes. It also helps retain moisture and facilitate skin repair. Massage the lump with vitamin E oil for a few minutes, 2 or 3 times daily for a week. Also, take vitamin E supplements after consulting a doctor or eat a diet rich in foods with vitamin E. some of the foods rich in vitamin E include sunflower seeds, spinach, avocado, extra-virgin olive oil, Swiss chard, asparagus, turnip olive oil, beet greens, almonds and others. Honey can in a great way help to get rid of armpit lump. Honey has ingredients that are anti-bacterial and anti-inflammatory which may help to clear up the lump, ease the pain, swelling and irritation. Apply some raw honey on the affected area; leave it on the lump for 30 minutes. Alternatively, you can mix 1 teaspoon of honey in a cup of warm water or green tea and drink it a couple of times daily for a few weeks. Avoid drinks that can delay the healing process such as caffeine. Avoid foods that make you sweat more such as spicy foods because sweating can lead to more bacterial development. Do not share your towels or toiletries with others. Avoid scratching the lump, which can affect healing and cause the infection to spread. Do not shave your underarms when you have a lump, which can further aggravate the condition. Avoid using talcum powder or antiperspirants with high fragrance until the lump subsides. To facilitate the healing process, keep your armpit clean and dry. Wash it regularly with antibacterial soap and keep the area dry, as much as possible.